When I started playing golf a few years ago I ended up buy a pair of Oakley sunglasses with a golf tint on the lenses. Love them. They make the course greener and lush looking and are perfect when playing 18 holes. It was the first time I saw Oakley sunglasses as stylish and practical for outdoor activities. When I went to San Francisco in January I popped into a Sunglass Hut in Carmel and tried on a pair of Oakley sunglasses with purple tinted lenses and knew I had to have a pair. When I was in New York City the other weekend I popped into Sunglass Hut and ended up trying on the Oakley Fringe sunglasses in clear with purple lenses. I was immediately in love and scooped them up. I’ve found that when I pay more than $10 for a pair of sunglasses I take care of them, they last longer and they look better. I think it’s totally worth the investment. 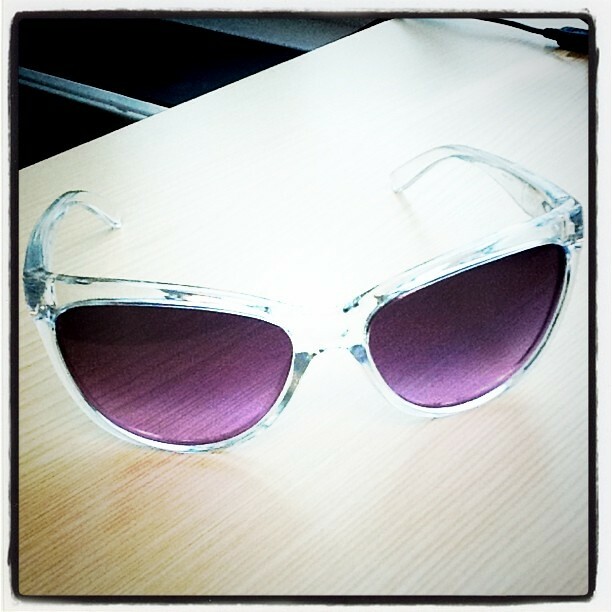 I’m obsessed with my Oakleys and I love the purple tint – it even works on overcast days.